I’ve been very deep into the nerdy world of ski touring boots for quite a few years now and have seen the progression unfold in front of my eyes. I was fortunate enough to work in a local backcountry gear shop when the great revolution occured. No, there was no political revolution from 2011-2015 in Western Canada. I’m talking about the ski touring gear evolution. On both the binding and boot front, substantial technological advancements were occurring yearly and institutional money (read: the big conglomerate alpine skiing companies) rushed in with their offerings to snap up marketshare from this new and enticing market segment amidst stagnating alpine skiing sales. I have over 250+ days on the Dynafit Vulcan and it is my most cherished ski boot I’ve ever had. Though some found them to be fiddly and prone to buckles breaking, I seemed to have been spared such inconveniences and I never broke a single thing on them and loved them dearly. They’re stiff; there is little progressive flex found in the boot but it was genuinely near that elusive “true 130 flex” that frequents gear nerds’ wet dreams. It walked very well but it was annoying having to take the removal tongue out to enjoy the full extent of its ski touring functionality. Furthermore, it was difficult to make the boot fit, especially in its tight instep. Now, with Eric “Hoji” Hjorleifson returning in a central design role with his proprietary “Hoji Lock System” in tow, Dynafit is releasing the next phase of their pursuit of the perfect hybrid ski touring boot with the Hoji Pro Tour boot this coming Fall 2018. I was lucky enough to get my hands on a pair of these beauties ahead of time and am excited to present my findings and thoughts with my fellow gear nerds out there! The Hoji Pro Tour, in all its aesthetic glory. As a general disclaimer, I’ve had about 12 days or so on the Hoji boots. Admittedly, I’d like to have more time on a boot before putting out a gear review so that there’s plenty of time for potential issues to arise. However, the end of the season is near and I just couldn’t wait to share my thoughts on this wicked boot! So understand that potential issues may or may not still arise and that if they do I will most likely address them as an addendum to this review! Alright, let’s do this shizz.. This is the bread and butter of what makes this boot so unique and is why we’re all here so let’s jump right into it: The Hoji Lock system. It’s been pretty cool to see Hoji develop this system the past few years along with Fritz Bartel so I was very excited to try it myself. The patent pending Hoji Lock system is a Dynafit technology in which with one flick of the walk mode from ski mode to walk mode, the entire cuff along with the strap and the upper buckle all open up to allow instant walk mode. Then, a flick back to ski mode has everything tightened up again to how it was before. Needless to say, this system blew my mind. I fine tune the boot to how I want it in the parking lot in the morning for downhill skiing and then once I’m done I flick the switch back to walk mode and walk over to the chairlift. After that initial setup in the morning, I don’t have to touch the strap or the upper buckle for the entirety of the day. Hence the saying that Hoji and Fritz coined: “pants down always”. Ain’t no ski pant gaiter being raised by me, baby. I’m excited to see how else Dynafit implements this technology into their other boots because I really feel like they’re on to something here. It’s one of those products that fulfills a need I didn’t know existed until it went ahead and solved it. And now I don’t think I could bear returning to such barbaric practices such as buckling and unbuckling my boots at each transition. There still is no “perfect” boot in the world, and unfortunately the Hoji boot indeed hasn’t achieve perfect boot status either. The reason I say this primarily has to do with the fit and the liner. Furthermore, I found the ankle box to be extremely tight as well. Though, due to me wrecking my ankle a few years ago, I have a bit of a cankle going on on one side so it’s a bit unfair for me to complain about it being tight. However, after talking with a few friends and having them try on the boot as well, they felt like it was excessively tight in the ankle as well. Regardless, this was nothing a shell punch couldn’t fix and I found that the grillamid plastic punched very well and held in one of the more sensitive spots of a ski boot (where the upper and lower cuff is riveted together). As you can see, a quick ankle punch and I was off to the races. Alright Mr. bro brah, this is the section you’ve been waiting for. How well does this Euro fruity boot ski freaking siiiiiickkkk Alaska spines? Well quick answer is if Hoji skis it it probably holds up. Foreword flex is amazing but I found that if I ever got thrown into the backseat, the rearward flex of the boot would bottom out and have me grasping at straws as I barely kept it together. So basically don’t be a hack like me that gets thrown into the backseat and these boots will always be there for you. Dynafit…. I love you. I love you but you’re making it hard for me to love you. I want to love you! Higher Ascent Efficiency! 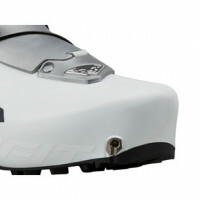 The shorter toebox and rotation point at the binding attachment set further back make walking even more efficient. Dynafit revolutionizes once again the connection between boot and binding, the legend continues. Regardless, I did in fact use the boot in the Marker Kingpin as I did hear rumours that it would “work”. So though I don’t condone doing it, I didn’t pre-release while using the boot in Kingpins. However, that’s a decision you must make as it is strongly stated that they are not officially compatible. But it can…. wink… work. The Hoji Pro Tour boot is very close to being the perfect unicorn boot we’ve been hunting for over the years. I think with a couple of changes it will get there, or damn near close. I’m optimistic of Eric and Fritz and the great things they want to do. The Hoji Lock System is truly incredible and I can’t wait to see what Dynafit continues to do with it. The boot skis phenomenally well and of course walks like a dream. The fit is a bit hard to nail, but once you get it dialed you’ll be thanking your lucky stars you figured it out. If Dynafit can work on this freeride-y boot to be compatible with more freeride touring bindings in the future, I think the Saturday Blackcomb backcountry mad dash to East Col will be done almost entirely in just this boot.